On the right hand side in this Gruppe you will see the guy with a trench broom, the Bergmann MP18. I only got one of these figures as I thought the MP18 would be a pretty rare site. I will add more as the collection grows though. And the other Gruppe, this has the usual mix of riflemen and bombers. Again, the poses in these figures are very dynamic and the detail is excellent. They have a real nice feel to them. And the MG08/15, these were traditionally mounted on frames, but some came mounted on these sleds for ease of movement in the trenches. This is another nicely modelled set, I intend on getting some more of these. In other news, I was in the Wargames Emporium in Sheffield over the bank holiday and picked up this second hand copy of Napoleon's Wars: The 100 Days. It has good reviews on Board Game Geek and seems to be a Napoleonic version of Memoir '44, which was another game I enjoyed playing. However it plays it was a bargain at only £20! 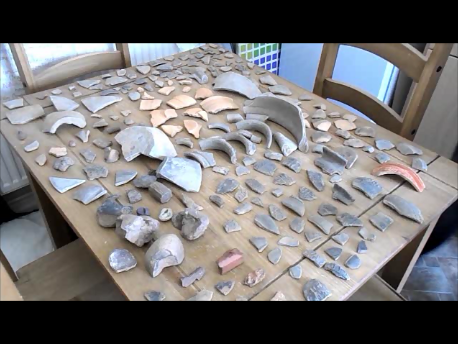 And finally, my company, Elmet Archaeological Services Ltd. have launched a crowdfunding project to fund an archaeological excavation of a back garden that has produced a lot of Roman pottery. If you are inclined to help us on the way, here is the PROJECT HOMEPAGE. Please have a look, even if you are only interested and share the link! Look at this lovely Roman pottery! !